Do I have stupid written over my forehead? Two people can't talk at the same time. When my mouth is moving, it means that you need to be quiet. If you live to be a hundred you will never be as smart as me. I'm here because I'm smart, not because I'm young and gorgeous... although I am! On your best day you're not as smart as I am on my worst day! My grandmother always told me; beauty fades, but dumb is forever! Sir don't pee on my leg and tell me it's raining. "Dont piss on my leg and tell me it is raining" means Your boss sets your evaluation score with a subjective number. You receive no bonus or raise in salary. You ask him why. He says your score was too low. Do you know when a gift becomes a loan? When the relationship is over. Have you ever heard that sir? Well, neither have I. I just made it up. New Updates! (4/20/2019) We've been working really hard on completing our membership system so you can submit quotes and keep track of them. Once this is complete in the coming weeks there will be a lot more quotes by Judge Judy and other authors. We've also changed the sorting on the site so you now see the latest Judge Judy quotes first. 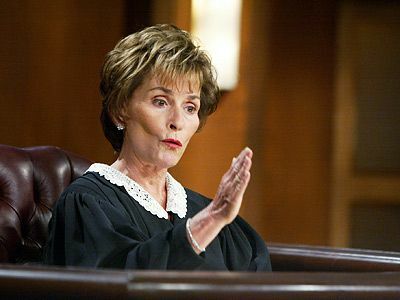 Our goal is to have the best Judge Judy quotes on the web!